New Hampshire authorities say the unidentified suspect walked into Modern Tan at 280 Main St. and demanded money while holding the needle. 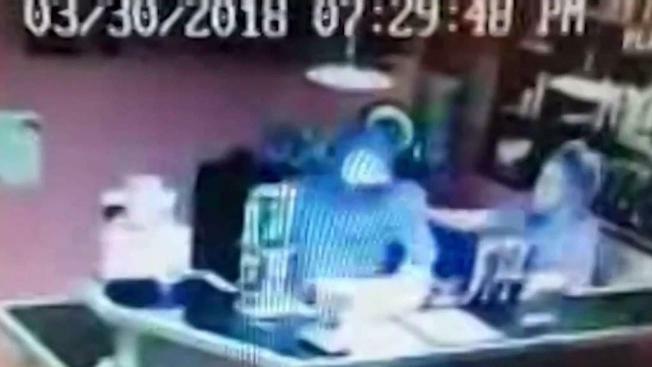 Police are searching for a man they say used a hypodermic needle as a weapon to rob a tanning salon in Salem, New Hampshire. Authorities say the unidentified suspect walked into Modern Tan at 280 Main Street on Friday, threatened an employee behind the counter and demanded money while holding the needle. The employee, a young woman in her 20s who was working by herself at the time, was pushed by the suspect several times. Her boss is proud of how she handled the situation. Police say the suspect had a getaway car waiting for him and that the man was able to get away with an undisclosed amount of cash. Three customers were inside the store at the time of the robbery. Police described the suspect as a short man with broad shoulders. He was wearing a black hoodie and white baseball cap. Salem police believe the robbery is drug related and are asking for the public's help finding the suspect. Anyone with information is asked to call Salem police at 603-893-1911.